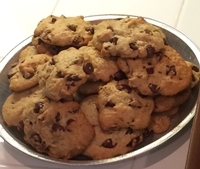 I originally had this chocolate chip cookie recipe in my bulky three-ring binder, and it got transferred to my Living Cookbook database when I made the conversion. It’s from the old Yahoo Vegetarian Group and was written by the group owner, the incomparable Donna. I followed Donna’s ingredients, but went my own way with the instructions. This time around I doubled the batch. I was making the cookies for Terry’s physical therapy team after she completed treatment. I mixed all of the dry ingredients in my Kitchen Aid stand mixer and then threw in the wet ingredients. I next added the chocolate chips and then walnuts which I chopped using the chopping attachment for my immersion blender. I used a soup spoon to place the dough onto baking sheets lined with parchment paper and baked at 375° for twelve minutes.